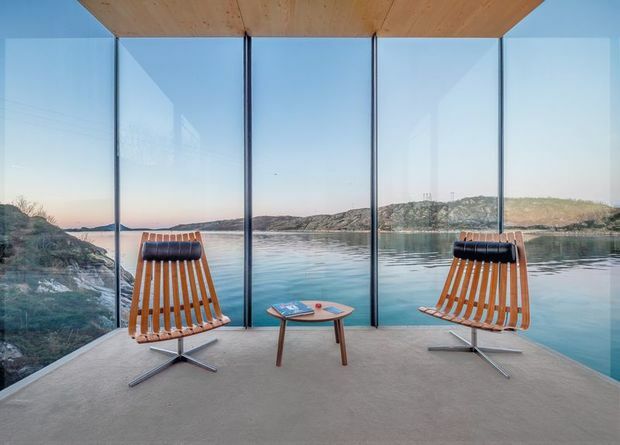 In recent years, we’ve seen the Scandinavians’ use of glass in their hotels and resorts skyrocket. And, with the region being known for its modernist approach and cutting-edge design, there's a good chance they're on to something. From heated glass igloos to glass-walled treehouses, there’s certainly something magical about being able to absorb the region's natural wonders from the comfort and privacy of your own room. 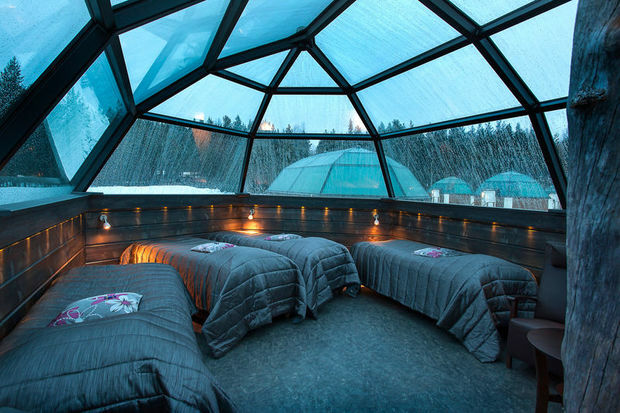 Finland's glass igloos come up trumps here, but there are further design-led gems, from Norway to Sweden, which put glass front and centre stage. Here we showcase the best that Scandinavia has to offer. Levin Iglut in Finland is a resort so remote that the constellations sparkle perfectly in the dark night sky. Even on the chilliest nights you’ll stay toasty as the modern and cosy igloos' glass-domed roofs are heated. You’ll fall asleep with, hopefully, the aurora’s ballet as your backdrop, and waking up to a crisp Arctic morning with rosy shadows over the silent snow-covered fells is a truly magical moment. Resist staying curled up in your igloo though, as heading out into the wilds presents a plethora of options to explore, from skiing and snowshoeing to dog sledding and snowmobile safaris. 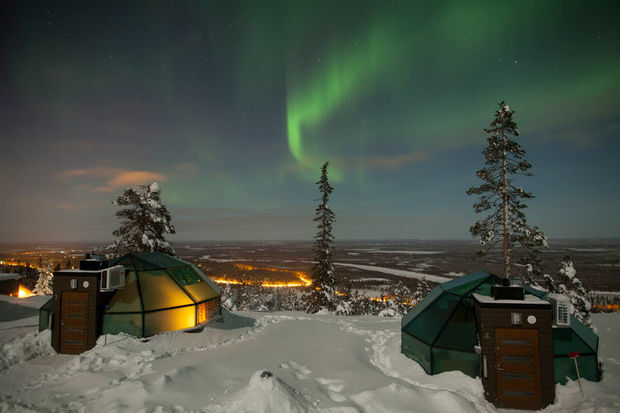 Stay here with our Glass Igloos and Northern Lights tour where you’ll pair a glass-igloo stay with reindeer rides, a wilderness cooking lesson, a husky-farm visit and three nights at cosy Hotel Harriniva. 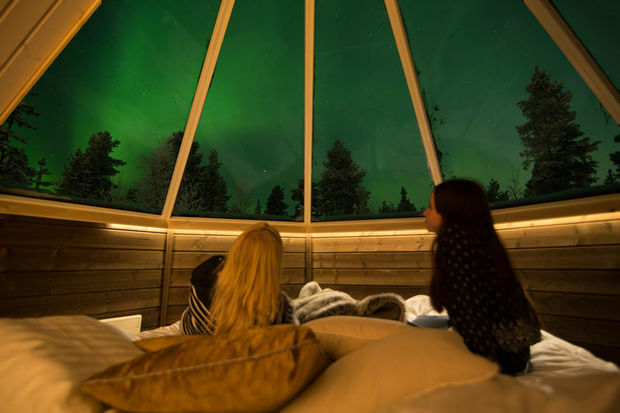 While seeing the Northern Lights can never be guaranteed, sleeping under glass certainly maximises your chances, especially in the dark, clear skies of Finnish Lapland. Kakslauttanen is perhaps the archetypal glass igloo resort, with photos of it seen everywhere accompanied by cries of ‘where is that?!’. It’s Kakslauttanen, and it's hygge at its finest. 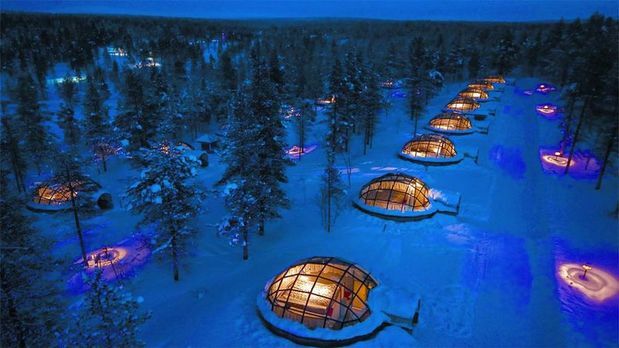 This resort offers classic bubble glass igloos – the domes act as your own private hideaway while you relax in a thermal sleeping bag with the shooting aurora above. 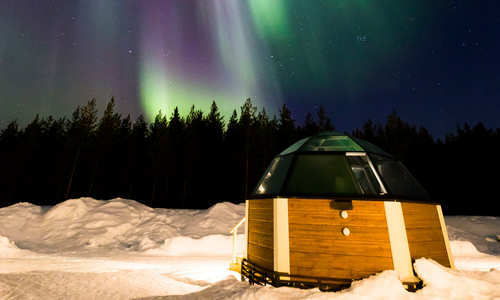 The resort also offers new and innovative Kelo Glass igloos, a timber and glass hybrid that combines all the aurora-viewing benefits of a traditional igloo stay with the cosiest of interconnecting log cabins complete with a roaring fire and, in true Scandi style, a private sauna. The beauty of the Arctic winter is perfectly showcased here, with a host of wintry adventures that include snow safaris, dogsledding, snowmobiling, snowshoeing and skiing. And, for something different, an autumn visit lends itself to horse riding, river cruises and canoeing, all set to a vibrant backdrop of golds and reds. Stay here on our Kakslauttanen Northern Lights Break, where you’ll indulge in relaxing saunas and hearty Lappish meals before settling in for nights under the lights. 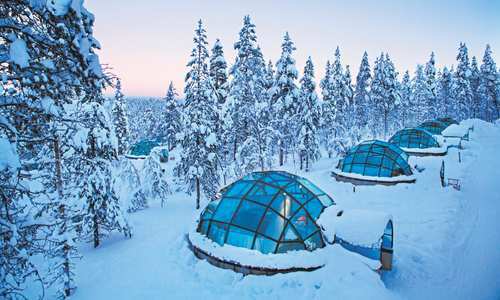 In the frozen forests of Finnish Lapland, a short transfer from Rovaniemi, the Arctic Snowhotel & Glass Igloos combines glass-topped domes with an intricately-carved snow hotel. 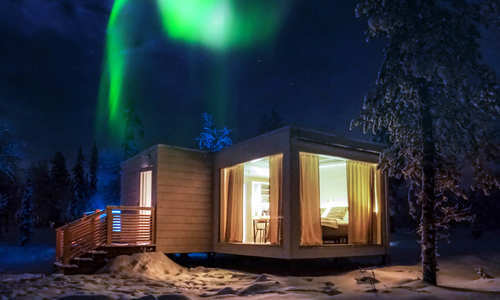 Surrounding forests, the starry night sky and Northern Lights all vie for your attention here, and if you fall asleep on your motorised bed, designed for optimal lights viewing, an 'aurora alarm' is on hand to gently rouse you. 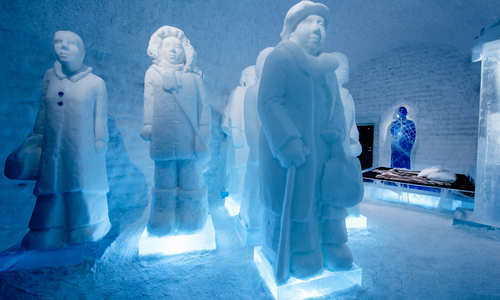 The neighbouring snow hotel, while not offering quite the same views, showcases ice-carving artistry at its finest as Arctic sleeping bags and mock furs keep you warm and snug throughout the night . Dining is not simply somewhere for a quick bite, either – the stunning lakeside Kota Restaurant offers everything from fresh fish to reindeer steak and forest berries, and the ice bar is a wonderfully evocative place to begin or end your night. Breakfast is included, and there's the chance or enjoy it in bed to views of the snow-covered pine trees. Then, spend the day ice fishing or skiing, before relaxing in an outdoor Jacuzzi or the resort's innovative icewall snow sauna. Experience it all on our Glass Igloo and Ice Hotel Holiday. 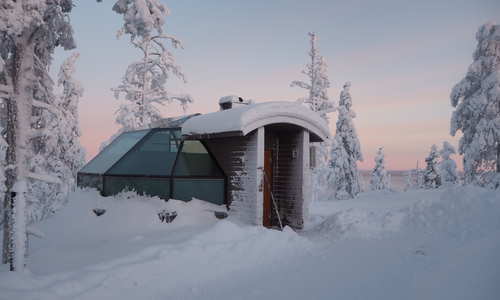 Muotka is all charm, featuring 26 log cabins and glass bubbles hidden in a remote Lapland forest. Pine trees thick with fresh snow and a network of nature trails surround the cabins, whose interiors are comprised of timber panels with rural vista paintings, terraces and fireplaces with blonde-wood décor. 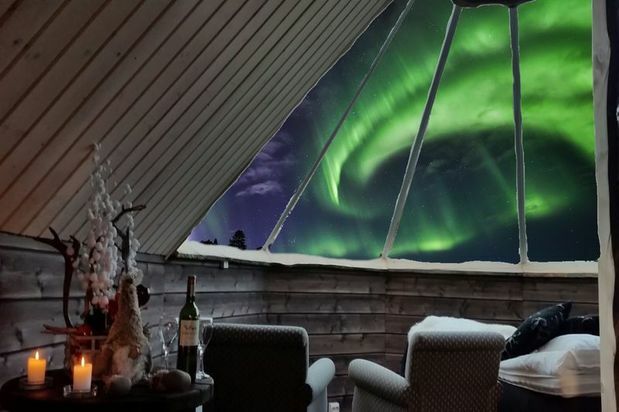 But, it’s the Aurora Bubbles that are most notable, with queen-sized beds set under glass-dome ceilings that look up to clear dark skies and – luck depending – those dancing lights; there's even a private sauna, the ultimate Scandinavian indulgence. Before your bedtime séance, enjoy dinner in the cosily lit restaurant, with dark-wood furnishings and roaring fires ensuring a wonderfully romantic space in which to sample delicious dishes created from local ingredients. Then, after your night under glass, you'll look forward to husky-safari adventures, or snowmobiling on the fells before a fireside picnic lunch. And, perhaps, after a day of excursions, head to the main lodge’s sauna, or the riverside’s snug, smoky equivalent. Experience all of this and more with our Muotka Wilderness Lodge itinerary, spending four days visiting reindeer farms and snowshoeing, culminating each day with an included Lappish dinner. 200km above the Arctic Circle, these design-led cabins are among Scandinavia’s most innovative. From your motorised bed, enormous heated windows look out across the snow-dusted forest and the inky black of the Arctic night, and when the Northern Lights are out in force, there are few more magical settings. Cabins offer the ultimate in contemporary Scandinavian style as timber tables and roaring fires combine with chic Nordic design; it all blends beautifully with the extraordinary surrounds. The deluxe cabins stand out with their own outdoor hot tub, while all feature a fridge, mini bar, WiFi and TV – though you’ll want to spend most of your time exploring the scenes that await outside. The ski slopes of Levi are just moments away, but it’s the wilderness that grabs the headlines, discovered with husky sledding, reindeer sleigh rides and Northern Lights hunts. Dining is enjoyed in a rustic cabin where menus showcase all manner of local, seasonal ingredients. But its magic perhaps lies in the next-door reindeer enclosure, which you can view as you eat. It's not just winter that showcases this area best – with Viking trails, fishing lakes and horse-riding adventures, it makes for a wonderful summer destination, too. Experience this stunning resort with our Levi & the Northern Lights Ranch itinerary, where you’ll immerse yourself in the wilderness with snowmobiling and snowshoeing before enjoying Nordic delicacies and a bedtime lightshow. This recent addition to Rovaniemi's already impressive range of hotels brings Scandinavia’s flare for architecture to the fore. Here, exquisite design and luxurious comfort provide the perfect base for exploring the Arctic surrounds. With blonde timber walls, white mock furs and a neutral aesthetic interspersed with subtle Nordic features, the glass-fronted Arctic Treehouse suites are both romantically snug and effortlessly cutting-edge, with pine trees framing the night sky for private Northern Lights displays. 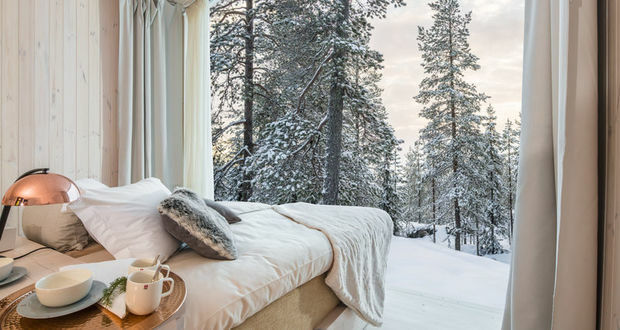 The Arctic Glass House suites are more reminiscent of a cosy, albeit luxury, log cabin, with a sauna, fireplace, decking area, and of course enormous floor-to-ceiling windows overlooking the snow-covered fells. Rakas, the onsite restaurant, is a highlight in itself. Its huge glass wall affords diners wonderful views of the forest canopy, with local produce and seasonal ingredients such as reindeer meat and fresh lake fish making for a delicious evening. A room with a view is not all that’s offered though – this is Lapland, and The Santa Park and Santa Claus Secret Forest are moments away. If visiting his permanent home doesn’t evoke excitement, head out on reindeer rides, al fresco private dinners and husky safaris to experience the best of a Lappish winter. There’s even the option to book treatments at a forest spa on the shores of a lake 20 minutes away. Book our Lapland In Style itinerary for snowmobiling fun, fireside suppers and nights in luxury cabins under the Northern Lights. The idyllic Norwegian island of Manshausen is an area seldom visited, which is very much part of its charm. 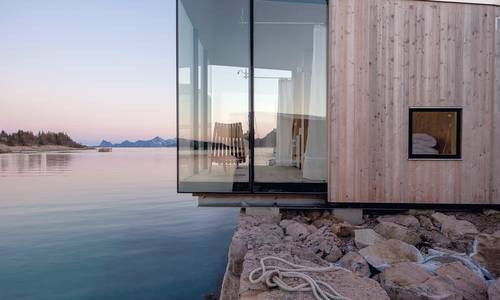 With cabins situated along a stone jetty and one on a natural ledge in the midst of the sea and mountains, the architecturally designed Seacabins, all floor-to-ceiling glass and Scandinavian timber, make for a wonderful base to explore the ever-so-picturesque surroundings. Enjoy local meals served in the main house, including fresh seafood, reindeer, elk and lamb, with a specialty of fresh cod and wild sheep. There’s even a bar perfect for enjoying quiet evenings overlooking the sea, before or after a dip in the communal hot tub. Activities cater for every season, with fishing, hiking and kayaking in summer to cross-country skiing and Northern Lights hunts in winter. Our Manshausen Seacabin Break offers the chance to stay in one of these striking cabins, discovering wild mountains and prolific wildlife before relaxing under the Midnight Sun's eerie glow or winter's aurora-filled skies. 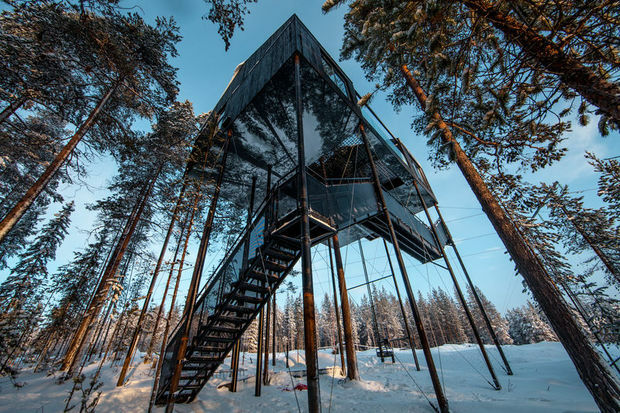 The Treehotel is an icon of Scandinavian hotel design, and the pine forests of northern Sweden offer a special chance to truly get close to nature. Many of the hotel's architect-designed treehouses feature glass walls as their main element, with everything from UFOs and bird nests to mirrored cabins. ‘The Dragonfly’ is particularly notable, with wall-to-floor glass and an exterior made out of sheet metal that will eventually turn rust-brown and blend in further with the pine-tree forest. Capsules are high up in the trees, but tear yourself away and you’ll find a plethora of activities for any season, with summer showcased in hikes, mountain-bike rides and moose safaris, which in turn give way to the thrills of winter adventure. Whichever season you choose, you can expect the very best in regional dining paired with the indulgences of a tree sauna and forest spa. Pair this and that other Swedish icon on our ICEHOTEL & Treehotel itinerary, combining a stay in the treetops with a night on ice and a host of optional winter activities. It’s all in the name. 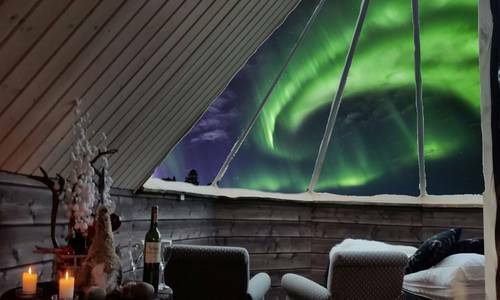 Apukka Aurora Borealis Resort offers the chance to gaze at up at the dark Arctic sky from your own glass-roofed dome or cabin, and hopefully witness the aurora as it performs its celestial dance. 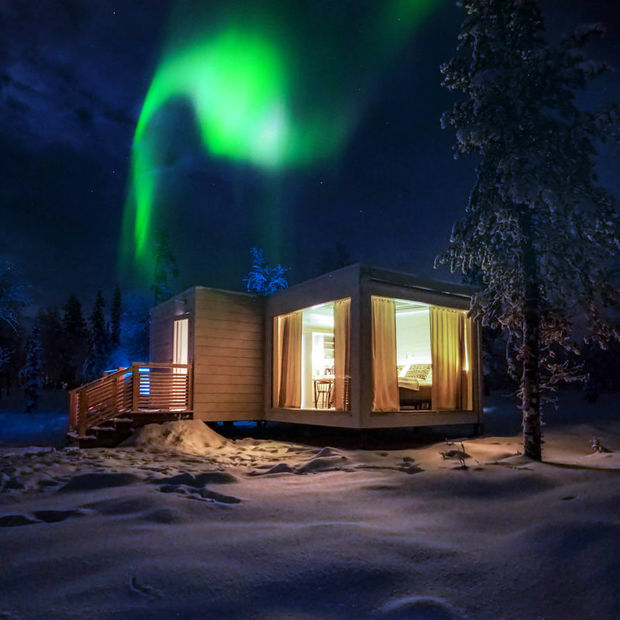 The resort's contemporary Aurora Cabins, fully heated and en-suite, are perfectly secluded, making them ideal for romantic evenings under the lights. 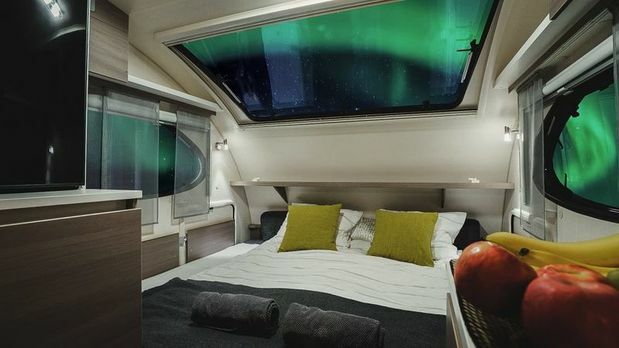 Even more impressive are the portable Aurora Wagons – luxury mobile carriages that feature double beds under a wide glass ceiling, they can be transported anywhere from snowy hills to frozen lakes in search of the aurora. And, while dining is a simple affair, guests can expect fresh and locally sourced ingredients from local lakes and forests, all enjoyed in a cosy Lappish lodge-style restaurant. This wilderness resort is close to Santa’s Village for day excursions and its wintry theme continues with an ice terrace, ice log cabins, an ice sauna and even an ice-carving workshop. 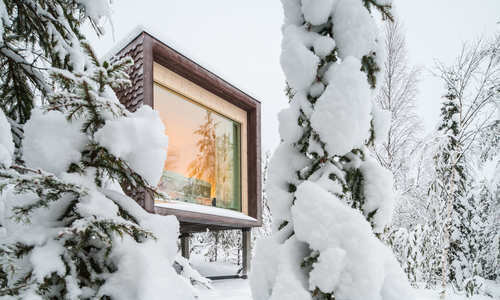 Most notable, though, is their sauna on skis (wheels if you visit in the summer), where guests can indulge in that beloved Scandinavian pastime in any given location. Our Northern Lights Break at Apukka Resort features a wonderful stay at this resort, exploring the area with husky safaris and chasing the famous lightshow.